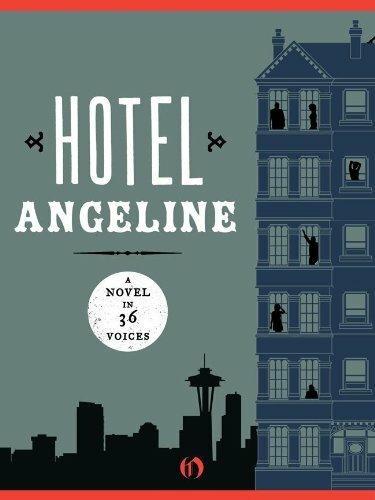 Hotel Angeline is by Kathleen Alcalá, Matthew Amster-Burton, Kit Bakke, Erica Bauermeister, Sean Beaudoin, Dave Boling, Deb Caletti, Carol Cassella, Maria Dahvana Headly, William Dietrich, Robert Dugoni, Kevin Emerson, Karen Finneyfrock, Jamie Ford, Clyde W. Ford, Elizabeth George, Mary Guterson, Teri Hein, Stephanie Kallos, Erik Larson, Stacey Levine, Frances McCue, Jarret Middleton, Peter Mountford, Kevin O’Brien, Julia Quinn, Nancy Rawles, Suzanne Selfors, Jennie Shortridge, Ed Skoog, Garth Stein, Greg Stump and David Laskey, Indu Sundaresan, Craig Welch and Susan Wiggs. And breathe! It is not, as you may be thinking, a collection of short stories but a surprisingly coherent novel written live on stage! Yes you read that right. Hotel Angeline: A Novel In 36 Voices is the product of The Novel: Live! The project was born out of a desire to avoid yet another arts festival full of reading after reading. Not that people don't enjoy readings but Seattle7Writers wanted something a bit different. Each writer wrote a chapter in two hours and the whole novel was completed in just six days! Now I'll forgive you for thinking, that's great entertainment but surely the book is a bit hit and miss? No, no, no. It turned out a wonderful story about a girl called Alexis who has an absent mother and is trying to keep a residence hotel running whilst there's a terrorist plot afoot and a body in the basement. There are of course changes in style but, with a handful of exceptions, you can barely notice the changes unless you're looking for them. I was too absorbed in the plot which is how it should be. I may be tempted to go back through the chapters and match up the writers at a later date. I'm not familiar with the majority of them but this book will definitely make me look out for their work. "There is no control over the past and none of the future. But there is control of the now." It's a bittersweet, sometimes darkly comic, charming, coming of age story and I had a teary-eyed moment towards the end. Hotel Angeline is being published in ebook format only by Open Road Media and is available from 3rd May 2011. 50% of proceeds will go straight back into the writing and reading community, providing grants for literacy and arts projects. You can read more about Seattle7Writers on their website. Thanks to Open Road for providing me with a review copy. P.S. Open Road have alluded to some additional videos about the project so I'll be doing a bonus post when I've got the details. I just couldn't contain myself any longer! This sounds amazing. I am taking a note of this. Thanks for that. Suzie: It seems that a lot of people are blaming ereaders for books only being available in ebook form but the reality is that these books probably wouldn't be available to us. I'd love it if they'd release a paper issue but I'm happy that I had the chance to read it at all! Oh thanks for clearing that up, I couldn't see any sign of a paper book! This sounds like a very interesting concept for a book. This sounds really interesting, must check it out!